It is always nice to hear from a flutist regarding their appreciation of our efforts or noting sometimes we have done that has enhanced their love of playing. It is because of this simple desire to promote flute and to serve the need of flutists and piccoloists that I established this company twenty years ago, now considered one of the best places in the country to purchase or repair flutes and piccolos. I am pleased to draw upon my three decades of experience in the flute sales and repair industry to provide the highest quality service and objective consultations to flutists, piccoloists and their families. As a high school flutist, I was awarded a music scholarship to go aboard and study flute performance at Academie Intenationale d’ete de Nice in Nice, France. The highlight of my performance career was performing a solo with an orchestra. I earned a degree in fine art with a focus in painting, sculpting and metalsmithing. I also began to develop and purse my interest in the technical aspects of flute making and repair. The highlight of my technical training was an invitation to study with the technical aspects of flute engineers at the Muramastsu flute factory and facilities in Tokorozawa and Tokyo, Japan. I served as chief technician for Muramastsu USA for ten years before. I remain passionate about providing detailed consultations for purchases and repairing instruments. I stay active as a musician now playing in church. I believe it is my extensive training , experience and familiarity with all manufactures, models and styles of flutes and piccolos that allows me to address the needs of the even the most discerning flutists, whether a soloist, orchestral, concert band, jazz, folk or rock musician. We sell, repair, service and adjust flutes with traditional felt pads as well as straubinger pads and other modern pads. I am please to provide free, objective consultations for instrument purchase or repairs. This level of service and sensitivity of flutists, piccoloists and their families results in flute specialists, Inc. being one of the most highly-regarded flute and piccolos sales and repair companies in the nation. We are committed to staying with you and your flute or piccolo from the time you purchase it through any repairs or adjustments it may need in its lifetime. Maintaining knowledge of the history of you and your instrument allows a unique perspective that enables us to address any needs that occur. It is our desire to develop enduring relationships with all flutists and piccoloists we are blessed to have the opportunity to serve. We are here for you when you need us. All Flutists, whether professional musician, educators, amateurs or intermediate or beginning level players, deserve the services of a highly skilled and experienced repair facility for all repairs from minor adjustments to complete overhauls. This level of expertise is also essential for proper pre-purchase service or warranty adjustments on new and used flute and piccolo purchases. A property maintained and repaired flute is a more enjoyable instrument to play as well as a protected investment. We look forward to helping you find the right instrument for your performance needs or helping you get the most out of the instrument you now own. Sergiy has been a technician at flute specialists for ten years. Emigrating from the Ukraine, Sergiy has a performance degree in accordion and a master’s degree in business management. Immediately upon his arrival to the US, Sergiy began his technical training as an apprentice with us. Sergiy is now a flutist and a citizen of the United States and remains as active member of the national flutist and piccoloist’s community as a repair technician. 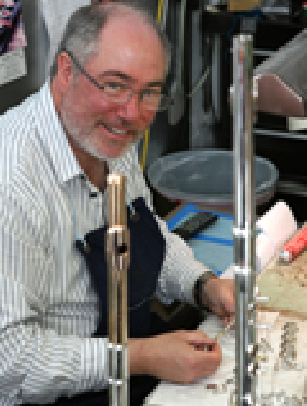 He is an expert in flute piccolo, alto, bass and contra bass flute repairs and new instrument servicing. Therese has a BSBA in Accounting from Central Michigan University. She has over 20 years of accounting experience in many industries. Therese isn’t a musician, but has over 20 years of dance experience. She currently resides in Rochester Hills, MI with her son, Joey and daughters Ashley and Katie. Heather has Master’s Degree in flute Performance from Oakland University and a Bachelor’s Degree in Music Education from Wayne State University. She previously taught band, choir and music appreciation in public, private and charter schools for five years. She enjoys working on the Flute Specialists' website and editing the newsletter. Tatiana received her Master’s Degree in Flute Performance from West Virginia University and her Bachelor’s Degree in Music Performance from Michigan State University. She gave her solo debut at Carnegie’s Weill Recital Hall in 2017. As an active chamber musician, she performs regularly with BETA Quartet and the Allegro Chamber Orchestra. With a passion for teaching, Tatiana was previously Associate Teacher of Flute at the WVU Community Music School and Flute Choir Director for the International Flute Symposium.